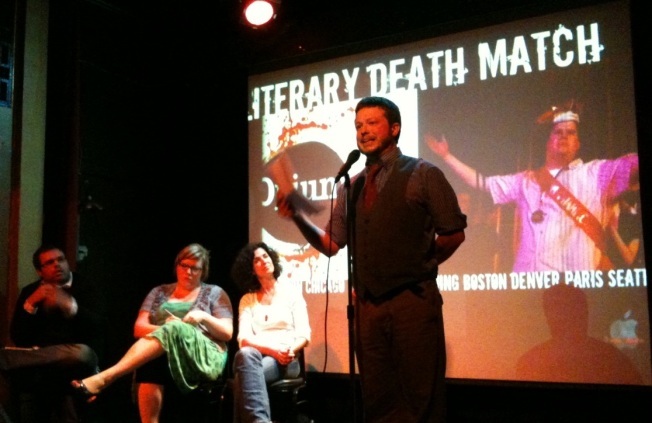 In the equivalent of Jell-O wrestling for book geeks, Opium magazine’s Literary Death Match is throwing four ladies into the ring tonight at the Bowery Poetry Club. But the pencils are down, and this is a reading with guts. Each writer will be given eight minutes to impress the audience and judges with the wit of her words and the charm of her performance. Afterwards the judges will lay waste to the losers in ways that make Gore Vidal look like LaVar Burton. Will good girl Elna Baker, who laughs-to-keep-from-crying at her painfully sheltered life in the forthcoming “The New York Regional Mormon Singles Halloween Dance,” be able to hold her own against Brooklyn native Janice Erlbaum, who recounted street life in the ‘80s in her memoir, “Girlbomb”? Sure on the face of it, it seems like a no-brainer. But this is the opposite of a no-brainer. Sure if they were fighting with knives the Brooklynite guts the Morman every time, but alas, they are not. Or will novelist and professor Elisa Albert or Blaise Allysen Kearsley, the host of the "How I Learned reading series, be the ones with their arms raised in glory? Scott Jacobson of The Daily Show and Tony Arcabascio, the founder of Alife, will decide. But keep in mind that regardless of whomever emerges with the title, you, dear blood-thirsty fight fans, are the real winners.